All batteries generate explosive hydrogen gas. Keep sparks, flames, and cigarettes away from batteries at all times. Do not connect or disconnect “live” circuits. To avoid creating sparks, always turn charging and testing equipment off before attaching or removing clamps. Always disconnect grounded cable first and connect it last to prevent dangerous sparks. Perform all work in a well-ventilated area. Never lean directly over a battery while boosting, testing or charging it. Protect your eyes! Batteries contain corrosive sulfuric acid that can destroy clothing and burn the skin. Neutralize acid spills with a paste made of baking soda and water or large quantities of water. Be careful! Neutralize any corrosion with a baking soda/water paste or battery cleaner spray. Scrape or brush off the residue and wash the area with clean water. Following your visual inspection, check the battery’s state of charge with a voltmeter. 1. Before removing old battery, mark the positive (+) and negative (–) cables for proper connection to the new battery. 2. Always disconnect the ground cable first [usually negative (–)] to avoid any sparking around battery. Then disconnect the positive (+) cable and carefully remove the old battery. 3. Clean and inspect. If necessary, repaint or replace the tray, hold-down and/or battery cables. Cable ends must be clean and corrosion free. Cable must not be frayed or bare. 4. Put corrosion protection washers on battery terminals. Install new battery in same position as old one and tighten hold-down. Be sure terminals will clear hood, fender, box lid, etc. to avoid vehicle damage and/or explosion. 5. Connect positive (+) cable first. Connect ground cable last. If side terminal connection, use a special side terminal torque tool to tighten side terminal cables to avoid damage. Never overtighten or hammer cables onto terminals. 6. Coat terminals and cable connection with a corrosion protection spray. The voltage regulator should be checked every 10,000 miles or every time you change oil. It should be checked immediately if the battery is hot to the touch, if electrolyte is bubbling or spewing from the vents, or if the open circuit voltage is below 12.4 volts or above 12.9 volts. Overcharging is evident by excessive water consumption and/or spewing or bubbling of electrolyte out of the vents. Undercharging is evident by slow cranking or lights dimming at idle. Maintenance-free, non-accessible batteries are designed to eliminate the need to add water. Yet the volume of electrolyte above plates may eventually become depleted due to abnormal conditions such as high heat or improper regulator setting. Use a voltmeter to check the state of charge. Do not open flush cover batteries! If opened, serious personal injury can result and warranty will be voided. 1. To avoid a battery explosion, never attempt to charge a frozen battery. Allow it to warm up to room temperature before placing on charge. 2. 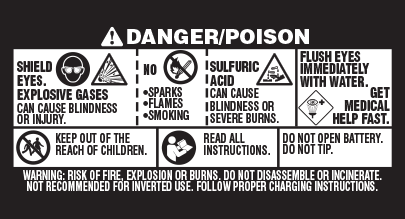 Warning: AGM (Absorbed Glass Mat) batteries require a voltage-limited charger. Charging an AGM battery on a typical shop charger – even one time – may greatly shorten its life. 3. Important: Never overcharge batteries. Excessive charging will shorten battery life. 4. Prior to charging, read the manufacturer’s instructions for proper charger hook-up and use. 5. Turn charger off prior to hook-up to avoid dangerous sparks. Protect your eyes! 6. The maximum charge rate in amperes should be no more than 1/3 of the battery’s reserve capacity minute rating. If the terminal voltage exceeds 16.0 volts while charging, reduce the charge rate. 7. Continue charging and reduce the rate as needed until a two-hour period results in no increase in voltage or decrease in current. 8. If violent gassing or spewing of electrolyte occurs, or the battery case feels hot to the touch, temporarily reduce or halt charging. Side Terminal Charging Posts should be used to ensure the best testing and charging results for side terminal batteries. The charging posts will provide a flush lead-to-lead contact. Be sure to tighten the charging post until it is snug and secure. This will allow a strong current to pass from the charging post to the battery terminal. Refer to owner‘s manual for manufacturer‘s recommended procedure. Shield eyes and face at all times…Never lean directly over battery when testing, jump starting, or performing other maintenance. Be sure vehicles do not touch each other. 1. Connect one end of positive (+) booster cable to positive (+) terminal of discharged battery, wired to starter or solenoid. 2. Connect other end of positive (+) booster cable to positive (+) terminal of assisting battery. 3. Connect one end of negative (–) booster cable to negative (–) terminal of assisting battery, wired to ground. 4. Complete hook-up by connecting other end of negative (–) booster cable to engine block of stalled vehicle — as far away from battery as possible...AWAY FROM MOVING FAN AND GAS LINES. 5. Start both vehicles and remove cables in reverse order of connection.